Price: $2200, which includes tuition, lodging, meals, & materials. Partial scholarships are available. The science is clear: Integrating social-emotional learning into the classroom and our schools is good for both students and the adults who work with them. But why is social-emotional learning (SEL) good for us? How does the practice of SEL improve our overall well-being--including our ability to learn, prevent burnout, and develop positive relationships? How can we cultivate these social-emotional skills in both our students and ourselves and encourage colleagues around us to do so as well? What gets in the way of developing our social and emotional competencies, and how can we overcome those challenges? This six-day, five-night retreat gives education professionals from all over the world the opportunity to hear some of the world’s leading experts on how to cultivate social and emotional well-being within ourselves and our students. In addition to lectures, participants will engage in deep self-reflection, thought-provoking discussions, and strategy sessions. Participants will leave empowered with cutting-edge, science-based social-emotional strategies, tools, and techniques to implement this important aspect of student and teacher development in their school environments. They will also leave with a deeper understanding of who we are as human beings. To apply, please click on the “Application” tab and fill out the on-line form. The application deadline was midnight on January 1, 2015. Applications submitted after January 1st will automatically be placed on the wait list. Vicki Zakrzewski, Ph.D., is the education director at the Greater Good Science Center and a former teacher and school leader. Brooke Lavelle-Heineberg, Ph.D., is a senior program officer at the Mind and Life Institute and co-founder of the Cognitively-Based Compassion Training program at Emory University. Pre-K through university-level educators, counselors, psychologists, and school and district-level administrators who are interested in cultivating the social-emotional well-being of students and the adults who work with them. "This was a phenomenal professional and personal development experience. In addition to enriching our mental understandings of how the brain and physiological systems help us or block us from experiencing positive emotion, the experiential practices helped us really feel the sensations we want to bring back to our schools. This was the best way I could have used these five days this summer! I would recommend this conference without reservation and with great enthusiasm! This conference clarified so much for me, and I feel much more confident about making specific changes to help my staff and students." "This institute has highlighted the importance of a teacher's (my!) mental and emotional health, an idea that so often, in education, is seen as selfish and/or a waste of time." Inside Out Screening at Pixar!!! Dr. Rony Berger, a senior clinical psychologist and family and child therapist, is an internationally recognized expert in dealing with the psychological preparation for and aftermath of terrorism and other major disasters. Dr. Berger is on the faculty of Emergency Medicine at Ben Gurion University in Israel as well as on the faculty of the Stress, Crisis and Trauma program at Tel Aviv University. He is the Director of the Disaster Relief and Rehabilitation Unit at Brit Olam, an international relief organization, and also a Fellow in Psychology Beyond Borders, a humanitarian organization which aims at alleviating psychological suffering in the aftermath of traumatic events. 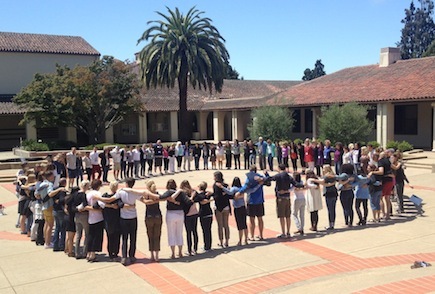 Dr. Berger has been on the advisory board of the Center for Compassion and Altruism Research and Education at Stanford University, where he helped design compassion cultivation programs and collaborated with Prof. Philip Zimbardo to develop manuals to enhance community resiliency and promote pro-social behavior and tolerance towards others. From 1999-2010 he was the director of the community services at Natal Trauma Center, where he designed community programs to deal with the impact of war and terrorism and trained thousands of professionals in treating trauma survivors. From 1997-2000, Dr. Berger was a Visiting Professor of Psychology and Behavioral Medicine at Al Quds University where he taught medical and graduate students and co-directed the Palestinian Center for Traumatic Stress Studies. Additionally, he served as a senior researcher at the Harry Truman Center for the Advancement of Peace at Hebrew University of Jerusalem. In training professionals and in leading emergency relief and medical teams, Dr. Berger has been involved in many major disasters including Oklahoma City, 9/11, Katrina, the tsunami in Asia, the terror attacks in Sri Lanka and Thailand, and the earthquakes in Turkey, Indonesia, China, Samoa, Haiti, and most recently in Japan. Brooke Lavelle Heineberg is the Senior Education Consultant to Mind & Life's Ethics, Education, and Human Development Initiative and a co-developer of the Call to Care program for teachers and students. She completed her PhD in the Graduate Division of Religion at Emory University. Her academic work focuses on the confluence of Buddhist contemplative theory and cognitive science, as well as the cultural contexts that shape the transmission, reception, and secularization of Buddhist contemplative practices in America. She was a lead instructor for several studies examining the efficacy of Cognitively-Based Compassion Training (CBCT) at Emory, and has helped to develop and adapt compassion-based for school children as well as adolescents in the foster care system. Prior to attending Emory, she earned her bachelor of arts degree in religion and psychology at Barnard College, and her master's degree in religion at Columbia University. While at Columbia, she also worked as a research coordinator for the Columbia Integrative Medicine Program, where she developed and taught yoga and Mindfulness-Based Stress Reduction (MBSR) programs for a variety of clinical populations. Brooke serves on the Board of the Foundation for Active Compassion and works as a consultant at the Center for Compassion and Altruism Research and Education (CCARE) at Stanford University. She now resides in the Bay Area where she develops and implements Innate Compassion Training (ICT) and Compassion-Focused Therapy (CFT) inspired programs and trainings. Dacher Keltner, Ph.D., is the founding faculty director of the Greater Good Science Center and a professor of psychology at the University of California, Berkeley. He is also the author of Born to Be Good: The Science of a Meaningful Life and a co-editor of The Compassionate Instinct: The Science of Human Goodness. Dr. Fred Luskin is the director of the Stanford University Forgiveness Projects, a senior consultant in health promotion at Stanford University, and a professor at the Institute for Transpersonal Psychology, as well as an affiliate faculty member of the Greater Good Science Center. He is the author of Forgive for Good: A Proven Prescription for Health and Happiness (Harper-SanFrancisco, 2001) and Stress Free for Good: Ten Proven Life Skills for Health and Happiness (HarperSanFrancisco, 2005), with Kenneth Pelletier, Ph.D.
Rodolfo Mendoza-Denton, Ph.D., is an associate professor of psychology at the University of California, Berkeley, and the co-editor of the Greater Good book, Are We Born Racist? : New Insights from Neuroscience and Positive Psychology. Rudy was born and raised in Mexico City. As a child, while his father worked for UNICEF, he lived in Mexico, Ivory Coast, Thailand, and the United States. These travels cemented an early interest in culture and intergroup relations. After receiving his B.A. at Yale University, he pursued a Ph.D. in social psychology at Columbia University under the mentorship of Walter Mischel and Geraldine Downey. He remained at Columbia for post-doctoral training, and became an assistant professor at the University of California, Berkeley in 2002. His professional interests include stereotyping and prejudice from the perspective of both target and perceiver, intergroup relations, and cultural psychology. Chris Murchison, M.Ed., is Vice President of Staff Development and Culture at HopeLab, guiding HopeLab’s efforts to create an organizational culture that values learning and innovation. Since joining HopeLab in 2005, he has led a strategic staff expansion to support a focused portfolio of work. He also has led the development of principles and practices that guide staff and organization development and embed HopeLab’s values into the everyday operations of the organization. Chris also has initiated an innovative, research-based health and wellness program uniquely tailored to HopeLab. The program emphasizes energy, engagement and personal fulfillment to significantly increase staff’s capacity for productivity and quality of life. In his 25-year career in the public and private sectors, Chris has focused on staff and organization development. Prior to joining HopeLab, he was with Charles Schwab Corporation in San Francisco, where he was Director of Talent Management and Development after first serving as Senior Manager, Schwab Technology Education, overseeing the development of career development and management development programs. His experience also includes nine years at the University of California, Berkeley, where he was Academic Program Coordinator from 1991 to 1996 and Manager of the Staff Internship Program from 1996 to 2000. Chris began his professional career as the Director of the Residential Leadership/First-Year Program at St. Lawrence University from 1988 to 1991. Chris was also a member of the San Francisco AIDS Foundation Board of Directors from 1997 to 2003, serving as Vice Chair from 1999 to 2003. Chris received his B.A. in Biology, with honors, from Earlham College in 1985 and his M.Ed. in Higher Education and Student Affairs Administration, with honors, from the University of Vermont in 1988. Dr. Emiliana Simon-Thomas is the Science Director of the Greater Good Science Center. She earned her doctorate in Cognition Brain and Behavior at UC Berkeley. During her postdoc, Emiliana studied care/nurturance, love of humanity, compassion, and awe under the mentorship of Dacher Keltner. Previously the Associate Director/Senior Scientist at the Center for Compassion and Altruism Research and Education at Stanford University, Emiliana’s research spans from the signaling, perceiving, and self-reporting of emotions to peripheral autonomic and neural indices of emotion to understanding the psychosocial benefits of emotional authenticity and connection. In other words, the potential for enhancing everything pro-social. Meena Srinivasan, M.A., National Board Certified Teacher, has taught middle and high school students in Brazil, India, and California and currently works for the Oakland Unified School District’s Social Emotional Learning & Leadership Development Team. She earned a Masters degree in Education from UC Berkeley and a Bachelor’s degree in History and Political Science from Amherst College. A student of Nobel Peace Prize Nominee, Thich Nhat Hanh, Meena serves on the Board of Directors of the Mindfulness in Education Network, was Core Faculty of the Mindful Education Institute, and is a recipient of the 2014 Hemera Foundation Contemplative Education Fellowship. Her first book, Teach, Breathe, Learn: Mindfulness in and out of the Classroom, was recently featured on Edutopia. She lives in the San Francisco Bay Area with her husband, filmmaker Chihiro Wimbush. Bringing together their passion for education, media, mindfulness and social justice, Meena and Chihiro started A Lens Inside to develop mindful media and films to create curriculum and educational programs that promote social emotional learning through the exploration of social issues. Learn more at teachbreathelearn.com. Monica Worline, Ph.D., is an organizational psychologist, scholar, speaker, and writer dedicated to enlivening the world of work. She awakens change agents in all kinds of organizations to the organizational psychology of involved in innovation, including an emphasis on curiosity, courage, and compassion as underpinnings of the human side of change. Monica’s aim is to cultivate work environments that bring people’s best work to life. Monica is an affiliate faculty member at the Center for Positive Organizations at the Ross School of Business, University of Michigan, as well as a founding member of CompassionLab, a research collabotory dedicated to understanding the expression of compassion at work. Monica also leads Vervago, an organization devoted to creating high-quality, evidence based teaching and learning experiences for adults in the workplace. Monica holds a Ph.D. in organizational psychology from the University of Michigan and a B.A. with distinction and honors from Stanford University. Dr. Vicki Zakrzewski is the Education Director of the Greater Good Science Center. In her blog for the Center’s website, Vicki explores how the social-emotional skills of students contribute to their academic success and future ability to become caring members of society. She also provides science-based tips for promoting the social and emotional development of students, teachers, and administrators, as well as methods for creating positive school cultures. A former teacher and school administrator, Vicki recently spent two months in India—at a school awarded the Peace Education Prize by UNESCO and the Hope of Humanity Award by the Dalai Lama—in order to research their methods for developing teachers’ ability to create caring relationships with students. She earned her Ph.D. in Education and Positive Psychology from Claremont Graduate University. Participants will dine in the Great Hall Dining Room with its richly paneled walls and coffered ceiling. Buffet menus offer a wide selection of hot entrees (including vegetarian and vegan options), a 100% organic salad bar, vegetables, soup, beverages, and desserts at each meal. All meals except two dinners are included, beginning with dinner on Friday, June 26, and ending with breakfast on Wednesday, July 1. Coffee, tea, and snacks will be available during the meeting sessions. Parking permits are available for $14.00 per day. The application deadline was midnight on January 1, 2015. Applications submitted after January 1st will automatically be placed on the wait list. Non-scholarship applicants will be notified of admission by January 15, 2015, via email. We ask that you kindly let us know by January 31, 2015, if you will attend. A 50% deposit to hold the spot is due by February 15, 2015, with the remaining payment due no later than May 1, 2015. Scholarship applicants will be notified of admission by February 1, 2015, via email. We ask that you kindly let us know by February 15, 2015, if you will attend. A 50% deposit to hold the spot is due by March 1, 2015, with the remaining payment due no later than May 1, 2015. If acceptance into the program falls less than 90 days prior to program start date, a 50% deposit is due upon acceptance, with the remaining payment due no later than May 1, 2015. If acceptance occurs after May 1, 2015, full payment is due immediately. $2,200 per participant. This includes tuition, materials, room, and board (except two dinners). Participants are responsible for their own travel expenses and arrangements. A limited number of partial scholarships will be awarded. To apply for a scholarship, please fill out the scholarship section on the application. Please note that UC Berkeley policy prohibits us from awarding scholarships for travel. If you are accepted into the program, a 50% deposit is required to hold your spot (see Enrollment instructions). Payment in full by check must be received by May 1, 2015. International participants may pay by wire transfer. For more information, please email ggsceducation@berkeley.edu or call 510-642-2490. Yes, there are two free evenings during the Institute.